I've had my HTC One for a couple months now and anytime I turn off the WIFI it forgets my home WIFI's password as soon as I restart it. I don't like leaving WIFI on when I'm at work, but it's a pain having to re-enter it when I get home. I was hoping the latest KitKat update would resolve this, but it's still doing the same thing. I found another thread where someone mentioned their only solution was to do a factory reset, and I'm hoping there is something else I can try first before going down that route. If that is the best solution though, what are some tips for doing a factory reset? What are some good backup apps? Go to Settings>WiFi. Press the 3 dots upper right corner of screen. Select Advanced. Scroll down to Auto Login, tic the box & got should be good to go. That way when you get in range of your router, it'll auto connect. I'm having the exact same issue. It just started out of the blue a few months ago. I've since wiped my phone, reset the router, tried different network SSIDs and passwords. Nothing works. For whatever reason, it seems my phone somehow lost all wifi login in info and no longer saves any new ones. WTF? You have a HTC One? Yeah, through Verizon. Also, I don't have an auto login option under the advanced wifi settings. This is endlessly frustrating. I don't want to have to sacrifice security and change my password to something short and easy just because I have to manually enter it every time I get home. This is just not making any sense to me. You should have an auto login option, can't figure out why you don't. I have AT&T but provider should have nothing to do with it. It should be part of the software loaded.... If you've never had a problem before, then it has something to do with the Rom you flashed, corrupt file or something. If it has been an issue since you bought the phone then it's something Verizon did. I have a feeling it has something to do with the Rom though. What Rom are you currently running? It's not rooted. It's a stock Verizon HTC One. Maybe that's why there's no auto login option? It only started going haywire this year, prior to the KitKat rollout. I bought it in September, and it had been working fine for months up until a few weeks ago. No other wifi device in the house is having problems. I did a total factory reset earlier this week hoping that would fix it, since that was a commonly proposed solution I'd found online, but nothing changed. Ok thanks. That's put me back on the right path. Has Verizon rolled out any OTA (Over The Air) updates prior to the KitKat upgrade? And was Kitkat an OTA upgrade? It's really sounding like a Verizon issue since it was working before and stopped working BEFORE the Kitkat upgrade. You can head over to the Verizon forums and look for a possible solution or next time ur out, go to the Verizon store and explain that they need to fix it. Are you sure this works on Verizon phones? It didn't do anything on mine. If you mean the regular update yes KitKat was recently updated on HTC One phones through Verizon. I don't really know about any prior updates since I've only had the phone for a couple of months. My HTC One is also a non-rooted Verizon phone like Scud's, and I don't have the auto login checkbox either. That's not really the issue though because if I leave wifi on 24/7 there is no problem, but as soon as I turn it off the phone forgets any saved wifi passwords / AP's and I have to reenter it in again. If I have to do a factory reset what is a good app to save my phone's settings? If you turn off you Wi-Fi connection, the phone will not remember it. You don't have to turn it off. You can leave it on and when you leave you Wi-Fi area, data will take over. Now you can set the phone to automatically connect to Wi-Fi when you get within range of your Wi-Fi signal. Also, if you don't want the phone to tell you every time it detects a Wi-Fi signal other than yours, that's easy to do. Go to Settings>Wi-Fi and this screen should show up, with your Wi-Fi router info of course. Now, select the three dot icon and select advanced from the drop down menu and this screen will display. I have checked the box so that when my Wi-Fi signal starts to weaken, data will take over. Now, the other box is checked telling the phone to connect to my Wi-Fi when it is detected. In the next picture, you'll see that I don't have the box checked next to Network Notification that would tell my phone to notify me of any Wi-Fi signal it detects, open or secured. This way, I am controlling what Wi-Fi network I want it to connect to. Now, let's say that your work has secured Wi-Fi & they're allowing you to connect. Look at the pic with the drop-down menu. You'll see an Add Network. Select that one and you can add another Wi-Fi connection and when the phone picks up that signal, it'll Automatically connect because you leave your Wi-Fi on. It's annoying as hell, as I get notifications for ANY network in range, open or not now. I'm not sure if the screen is any different than it was when I got it, though. You'll see an Add Network. Select that one and you can add another Wi-Fi connection and when the phone picks up that signal, it'll Automatically connect because you leave your Wi-Fi on. Manually adding the network didn’t work anymore than just scanning and connecting once in range. It still won’t remember the info. If you turn off you Wi-Fi connection, the phone will not remember it. You don't have to turn it off. Leaving it on while I’m at work simply isn’t an option for me, so that’s not a viable solution. It would be a nice workaround if I could, but it would only be a workaround. I’m still trying to figure out why it won't save the login info in the first place. I appreciate the help, though. The reset didn't work for me. Hopefully you’ll have better luck. No recommendations on a backup app though. The few things I needed I just copied over to my computer. Well that's to bad that you cannot leave the wifi connection on at work. Like I said in my post, if you turn it off (Wi-Fi cpnnection) it does not remember my passcode. And I've been rooted since the day after I bought it. Sorry mate, as far as I know, there is nothing that will allow your phone to remember the passcode once you turn the Wi-Fi connection. I'll keep searching to see if one of the devs at XDA have come up with something so don't give up the ship. Edit: OK guys, I believe I see what must be done. I was looking at the screen shot of the stock HTC One and there is not an Auto Login selection as with my phone being rooted. Take a look at your screen and compair to this one. So, in order to have your phones remember the Wi-Fi passcode, you'll need to be rooted. Now, rooting may appear daunting, but the devs have really made it easy. As a matter of fact, I learned how to root from Androidcentral. So, there you have it. Either write down your passcode in your wallet or root your One. If you don't want to root your One, having the passcode written down and having to enter it each time is kind of a PIA but it's just a little time consuming. Good luck and keep us posted as to how you're doing. It *never* remembers a Wifi pass code? Mine had been doing so for about 4 months. I can't help but think there's something seriously wrong with your phone too. I know there's a file stored on the phone that lists all saved SSIDs and pass codes. I'm not rooted, though, so I can't get to mine. You should be able to get to yours, and at the very least just add your network info to the file with a text editor. That was one of the first things I came across researching this problem. You may be right but I have not seen that file of saved SSIDs and pass codes. Probably cuz I've never had to look for it. Thanks for that and I'll start searching to see where it is. Also, something just came to mind. Is you carrier AT&T or Verison. Hey Aaron, I've been talking with a buddy of mine and we both, along with Scud_1373, believe that you should talk your One to the carrier. My buddy & I have been rooted so long that it's something we don't remember. Scud can't reproduce it, and I don't remember ever having a Wi-Fi connection problem. So, in order to have your phones remember the Wi-Fi passcode, you'll need to be rooted. Well, no, we shouldn't *need* to be rooted... that's the entire point. Our phones were working correctly, automatically reconnecting to known passcoded wifi networks once in range (as all my Android phones have done until now), then at some point something broke and we're trying to find out exactly what and why. Remember, you told us *your* phone is having the exact same problems we are; you're just able to leave it/wifi on at all times to get around the phone forgetting the info. Since you're rooted, you have access to the file. If any network you use isn't listed in the file, you can add it with a text editor, which should fix your problem. Good luck. I figure the wpa_supplicant.conf file is the source of the problem. That it's somehow been corrupted and the info is no longer being stored there, so the info lasts only as long as your connected to the network. Is there anyway to get access to this file that doesn't involve root? Yeah Scud, I'm apologize for that wrong "need to be rooted" info & I hope it didn't lead you or anyone else down a wrong path. I will see if I can find stock access to the file. I'm not sure if you can access that file info or not, but take a look. If you can't remember your WiFi password, you can recover it with SmartKey WiFi Password Recovery to find it. I recently use it to do that and it works for me.You can google search "smartkey wifi password recovery" to know more about it. I know this is an old thread, I found it looking for the same answer. My HTC One Remix would not remember the network key. It was getting old entering a 40+ charactor password everytime I wanted to use my home wifi. My fix was to use the WPS (Wi-Fi Protected Setup) pin entry in my router's config. 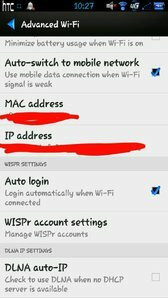 On your phone, goto the settings -> wifi -> 3dots and you should see WPS Push, and WPS Pin Entery. WPS Push did not work for me. WPS Pin Entery will give you a pin # to put in your routers config WPS pin box. try this, forget the network, then under wifi> click the three dots ... and then > add network, then type the name of the wifi(you have to know it), then i went again to connect to it with the password, and it now remembers even if i turn it on or off. I do have the autologin checked, or else it will not connect. I notice the problem with new networks, or old ones that i clicked forget. Can't send or receive picture messages? How can I unroot my Note 10.1 2014 so that I can get OTA updates? How can I prevent apps from auto-updating (for the KitKat update)?